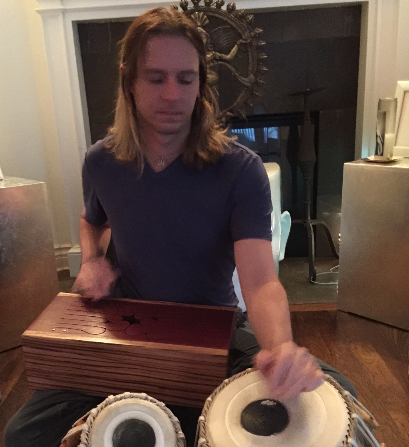 Arjun Bruggeman, world percussionist and session recording artist, is highly acclaimed for his unique hybrid of East-meets- West rhythms. At the age of 14, Arjun embarked on a touring career with punk rock bands. His interest in early progressive, metal and jazz rhythms led him into a creative journey and later found himself enthralled by world percussion. Simultaneously, Arjun practiced many forms of Eastern spirituality. Through these explorations he merged the inner quest with the exterior expressions of sound and found himself supporting spoken word with Coleman Barks and David Darling. Arjun recalls, “I wanted to go deeper. I wanted to support something that was bigger than me something more than music.” This profound experience led Arjun to meet Krishna Das and a connection with Neem Karoli Baba. Soon thereafter he began touring with Krishna Das worldwide and over the past decade has shared the stage with noted musicians Sting, John Densmore, Mark Egan, Jerry Morrata, Steve Gorn, Jackson Browne and Crosby Stills and Nash. Arjun has recorded and performed with artists such as Jason Mraz, Belinda Carlisle, Jon Anderson, Trevor Hall, Robert Bly, Michael Franti, Hu Dost, Snatam Kaur, Shyamdas, and The John Ginty Band. In 2016, Arjun released his self-titled debut album Arjun. The six-track album features all original compositions exploring the musical journey of the soul. Arjun is currently in the studio recording his follow-up offering of world percussion centered on improvisation. Additionally, he has recently partnered with renowned jazz artist Mark Egan, the duo’s album is scheduled for release in the fall of 2017. When he’s not touring or in the studio, you can find Arjun at Iron Maiden concerts.